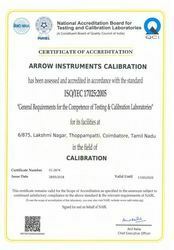 Arrow Instruments Calibration'' Commits to continue improvements in the quality of calibration servicing to our clients, from implementing the following steps. Regular internal quality control using secondary reference materials. Participation in inter laboratory comparison and proficiency-testing programmer. Replicate calibration using the same or different methods. Client satisfaction is the main aim of our company. We are a client centric organization and offer international quality standards in providing services for our items that are handled and are modified as per the client''s specifications. Our valued clients are satisfied with specified delivery in time of various items ranges. We are backed with high industry experience, and offer these items to our clients in customized form who helped us to attain the utmost satisfaction of our customers. We offer 100% client satisfaction to various clients.